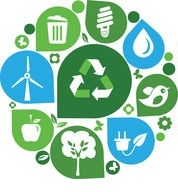 • Material Preparation — please click here for information on the NEW recycling procedures effective August 2011. Single stream recycling is here! Please empty and rinse all containers. Residents should also note that cardboard beer and soda packs are now recyclable as well as aluminum pie plates, trays and foil. The MUA now accepts plastic food and beverage containers and rigid plastics with the #1, #2, #4, #5 and #7 symbols on them. Shredded paper, click here to to see schedule. • Label Containers. Please use identifying labels (e.g., trash only, recyclables only), especially when lids are placed on the containers. • Container Weight. All containers must have handles and should weigh no more than 50 lbs when full. • Recyclables must be placed at the curb the night before collection. To minimize the number of missed pick-ups placing the materials out the night before, residents ensure the materials will be at curbside when the truck arrives.